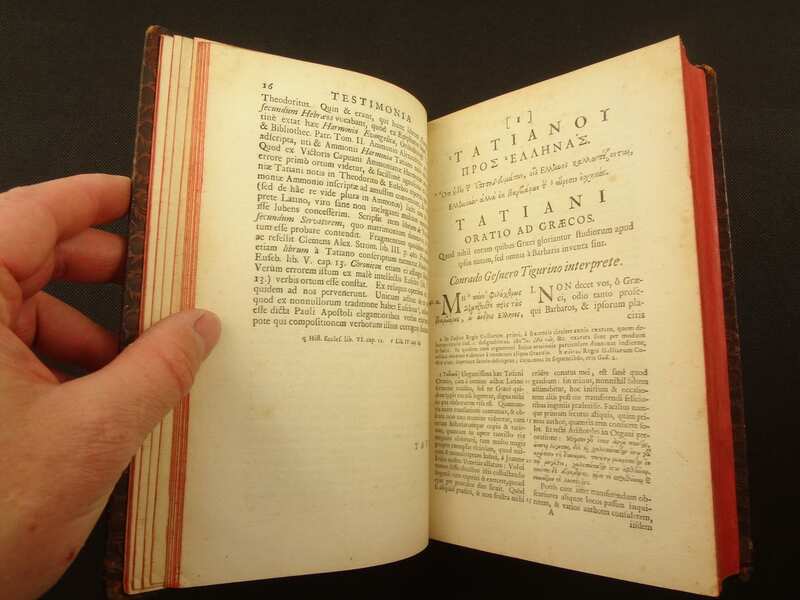 1700 Oratio ad Graecos, Tatian. Polyglot (Greek & Latin). Oxford, Theatre Sheldonian. 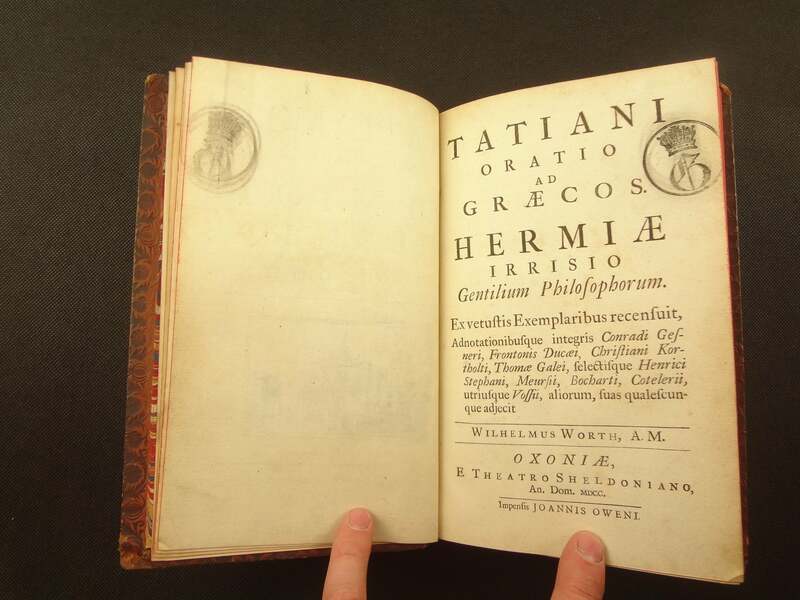 A handsome 1700 edition, in Latin and Greek, of Tatian's classic Oration to the Greeks with notations from a number of scholars, printed in Oxford's Theatre Sheldonian. 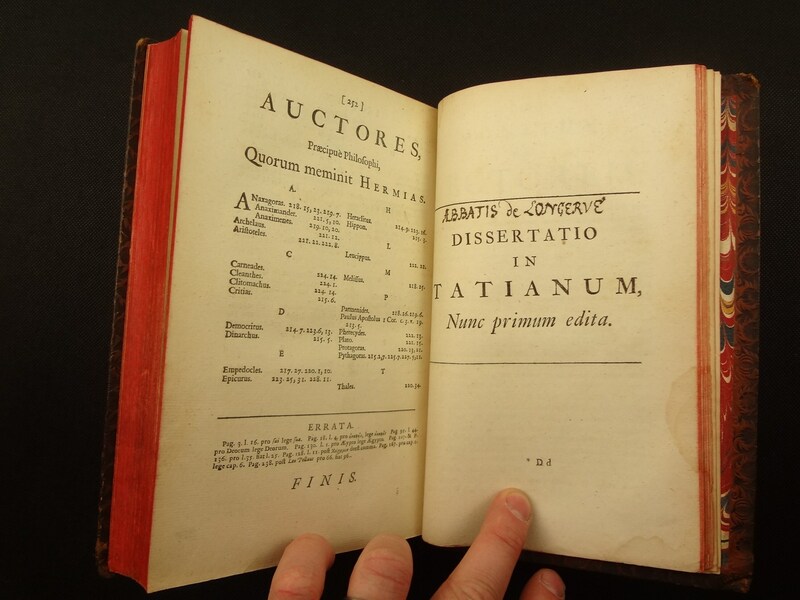 Also, bound at the rear, Abbatis de Longerve's Disseratio in Tatianum. Concerning the date and place of his birth, little is known beyond what Tatian tells about himself in his Oratio ad Graecos, chap. xlii (Ante-Nicene Fathers, ii. 81–82): that he was born in "the land of the Assyrians"; (referring to Syria) Tatian was not born in geographical Assyria (Mesopotamia), he was born to the west of the Euphrates (Syria) scholarly consensus is that he died c. 185 AD, perhaps in Adiabene. He traveled to Rome, where he first encountered Christianity. During his prolonged stay in Rome, according to his own representation, his abhorrence of the pagan cults sparked deep reflections on religious problems. Through the Old Testament, he wrote, he grew convinced of the unreasonableness of paganism. He adopted the Christian religion and became the pupil of Justin Martyr. 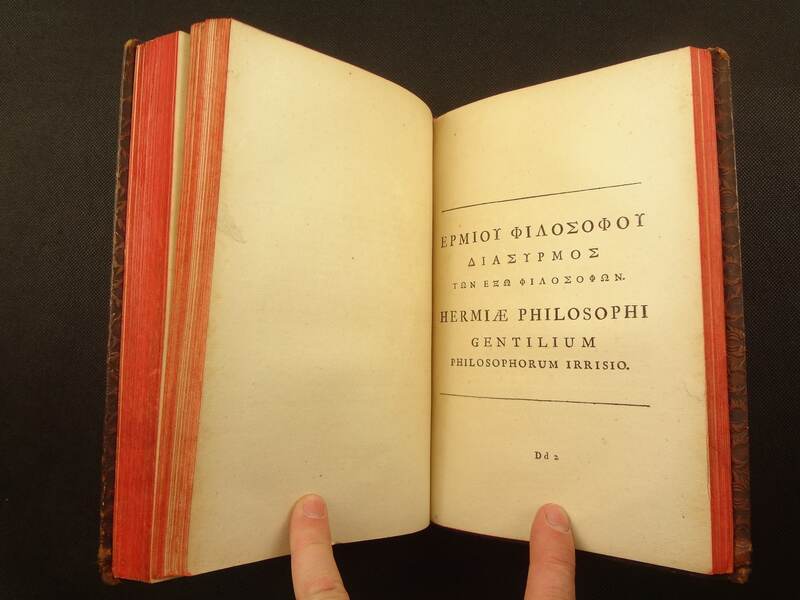 During this period Christian philosophers competed with Greek sophists. Like Justin, Tatian opened a Christian school in Rome. Knowledge of Tatian's life following the death of Justin in 165 AD is to some extent obscure. Irenaeus remarks (Haer., I., xxvlii. 1, Ante-Nicene Fathers, i. 353) that after the death of Justin, he was expelled from the church for his Encratitic (ascetic) views. Measures 21 x 13.5 x 3.5 cm. Calf over thick bevelled boards (likely wood). Blind tooled; boards with several frames and corner florets. 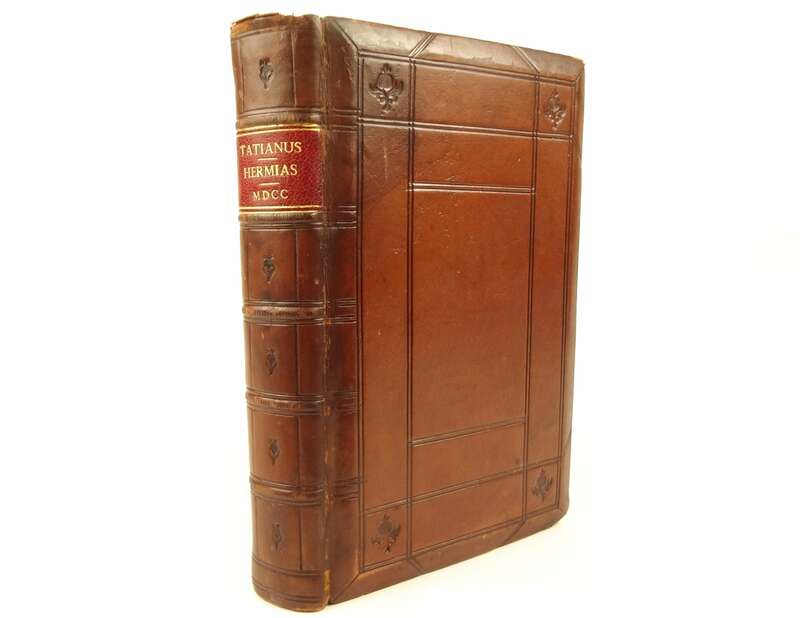 Spine with five lightly raised bands; five compartments with central florets, sixth with authors and date in gilt on red moroccan. All edges painted red. 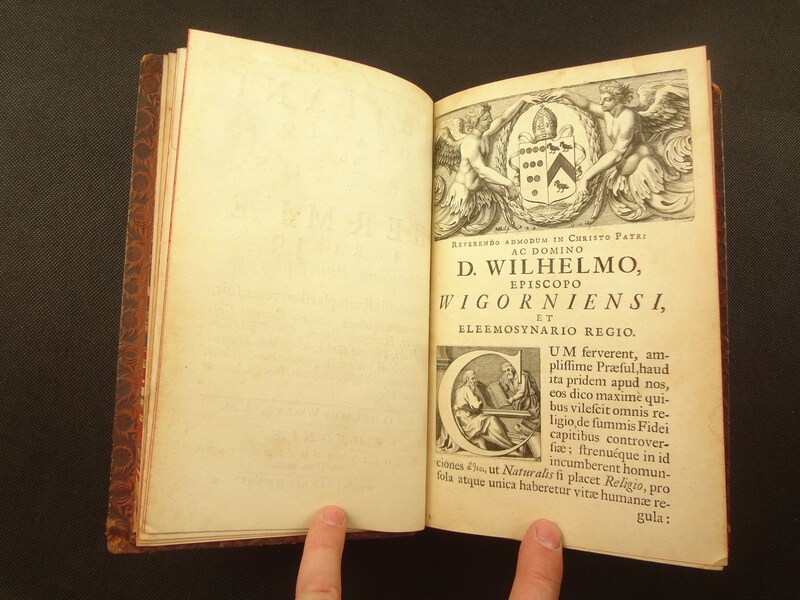 The binding is handsome, and combined with the stamp offers an opportunity to discover it's provenance, which is likely impressive (crown stamp). Pages - (2), xvi, 252, Dissertatio - xxvii, (1). See pictures. Handsome book, with a little wear of time. Binding has edge wear, slight joint cracking, bottom corners of boards bumped, and a little chipping at head of spine. Some darkening at joints, likely from oiling. Blank unpaginated endpaper has Tatian inscription in Greek. 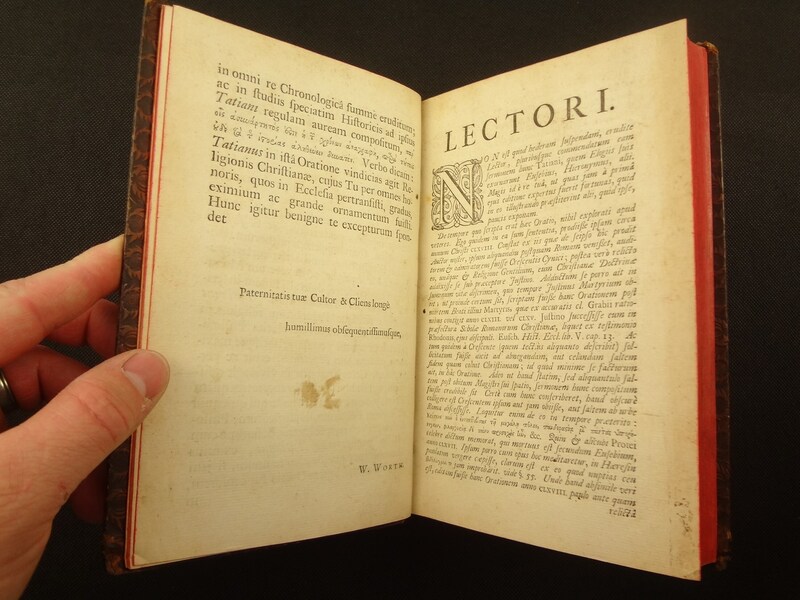 Imprimatur page has stain at top right corner. 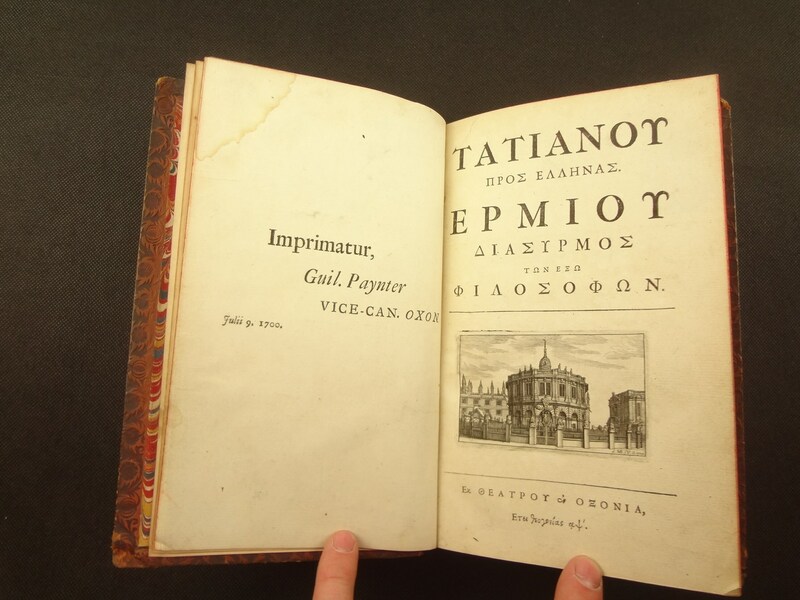 Latin title page has crown stamp which has ghosted onto the back of the facing page (greek title page). Occasional thumbing, edge toning, foxing (light, occasional), and small pencil annotations in margin ("+" and check mark). 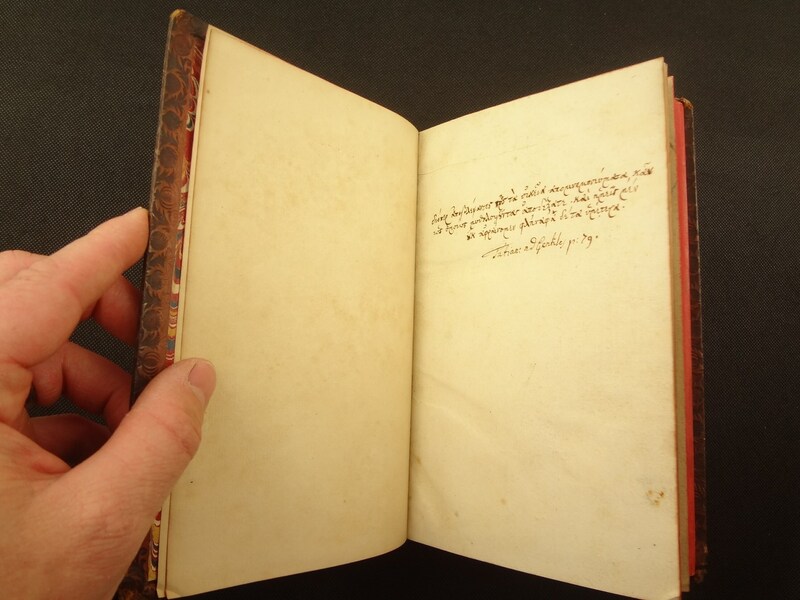 Dissertatio in Tatianum (bound in, at rear) has some marginal moisture marks; not in the rest of the book, caused before they were bound together. There is also a name written on the title page of the Disseratio. 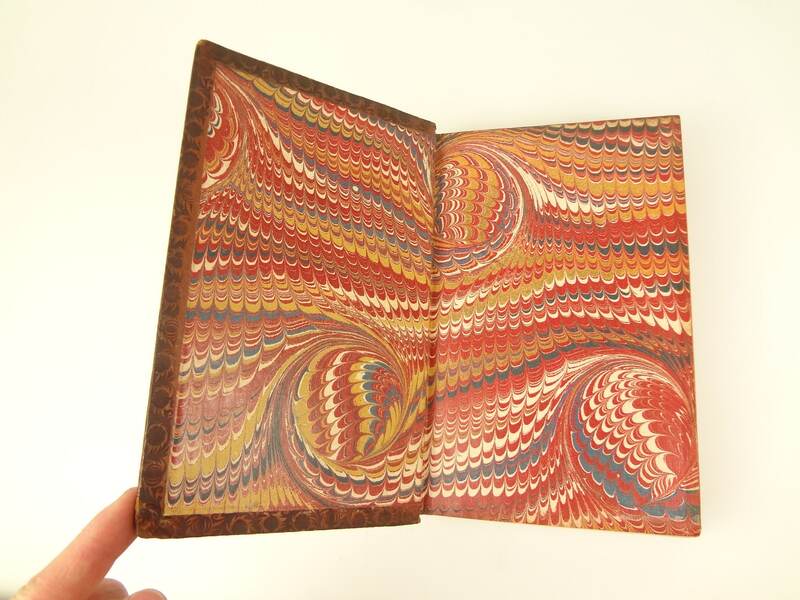 A handsome binding, housing a good example.